Installing a fish finder on a kayak is not rocket science. You can conveniently do it if you have the right knowledge at your fingertips. Also, we would suggest you read this guide on to better understand how fishfinders work and what makes them so useful to us. But before we delve into that, let’s look at some tips and tricks to give you better performance. Ensure you first head over to the manufacturer’s website and register the fish finder you have bought. Don’t also forget to download any of their latest software for updates. A good battery life will give your transducer better picture quality. The power needs to be stable in order not to get interference with the image quality, which will cause all sorts of problems with your sonar unit. 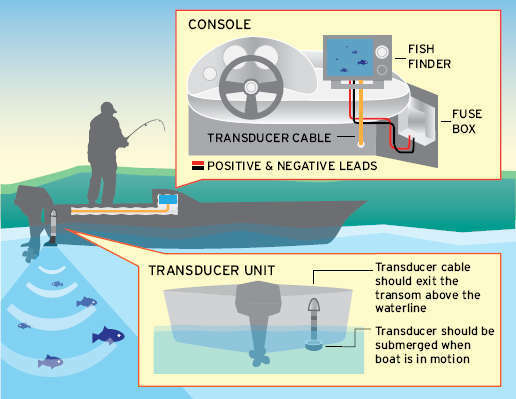 The way you position the transducer determines whether you’re going to get a clear image on your sonar or not. So make sure you mount the transducer in the right location on your transom as well as sitting at the right angle. One way to do that is to make sure you place the transducer to skim right over the water surface. Without your transducer being leveled, your sonar unit will produce poor image quality. So during installation, always make sure you set up the transducer correctly. Here is a step-by-step guide to help you set up your portable fish finder on your kayak to give you maximum performance. Step 1: The first thing you want to do is to figure out where on the boat you want the fish finder to go. We recommend you want it in front of you within an arm’s reach. You don’t want it to be on the side where it is going to be in your pad or stroke. Step 2: The next thing you have to do is to look at the boat and find a suitable flat surface on the bottom of the boat where you are going to mount your transducer. Step 3: Next, you want to do is to get a piece of sandpaper and rough up that actual place inside the kayak and clean the area of any debris. Doing this will make your transducer pad sticks solidly to the bottom of the boat. Step 4: The next step is to take your install pad and apply a thin layer to the lower part of the setup pad. You can use a thin bead on it. Just make a nice little rim around your install pad. Also, it’s imperative that whenever you put the install pad in the kayak, you’ll have to get it lined up with the direction of the transducer or pointing towards the front of the boat. Step 5: The next step is to reach inside the kayak and apply the install pad in the location. Apply some glue pressure and give it some time to let it dry. Depending on the temperature and humidity, drying can take up to 24 hours. Step 6: After the transducer pad has been glued in and getting the time to dry, the next part is to stick the actual transducer itself into the bottom of the boat. Step 7: Take a Goop and put the nozzle of the Goop tube against the Kayak to eliminate a lot of bubbles. You can also use a toothpick to smooth the Goop around and get the excess air bubbles out because you don’t want those in there as it will cause interference with your transducer reading. Step 8: Once you have applied the Goop and the transducers are glued to the bottom of the boat; you have to give it some time to set for a couple of hours depending on the temperature and humidity. Keep it well ventilated so that it will dry up evenly. Step 9: After that, you can go ahead and start mounting your fish finder unit to the boat. The first thing you want to do is to take the base of where the fish finder is going to be installed and remove the bottom portion just to make it easier for yourself. Step 10: Take a spot on your boat that is usually flat, not a curve, surface so that you can have a maximum amount of contact with your boat for a stronger connection. Step 11: The next thing to do is to drill a pilot hole on the flat surface provided on the bottom portion of the base of your fish finder. Step 12: After drilling, you can go ahead and grab your mount screws and run it into the boat. Step 13: Once you get your screw through, try and use a washer on the backside to give a lot more resistance on the back to create more tension for a stronger connection. Step 14: After that, you can attach the fish finder head unit to the top mounting part. So first, remove the fish finder basic head. Step 15: The next step is to line up the holes and drop your mounting screws in and tighten them up. Step 16: Once the fish finder head is assembled, you can go ahead and reassemble it to the base. Step 17: The next step is to find the location in the boat where you want your transducer wires actually to come out of the boat. Step 18: Find a flat surface again and use a Grommet to go around your power cables and your transducer wire. Step 19: Go ahead and split the garage, set it off, then size it accordingly to whatever Grommet size you are going to be putting the boat. Step 20: After that, find the location of the boat and drill your hole and install the grommet with the wire running up through. Step 21: The next thing is to connect power to the unit. But you are going to need a little setup before that. So the first thing to do is to take your transducer power line and your 9-volt battery connector. Step 22: You will observe that the power line has two red wires. For the two red wires, put your cable connection on the end of both wires and use a set of pliers to pinch the orange button down to secure your connection. Step 23: Repeat this process for the black wire also. Step 24: Take the wires and snap it to the 9-volt battery connector with an actual harness, and then install your 8-double batteries. Step 25: What you want to do is to get all the excess wire on the Kayak and transducer bumbled up and get off the way. Of course, you can leave the excess wire inside the kayak, or you can or bundle it somewhere inside the boat to keep it motionless. So that means you don’t have to worry having your line sliding around bumping your transducer or anything else. Step 26: The last part of the process is to plug your wire into the back of the fish finder and fire up the unit. Once it is on, everything is good to go. Step 27: Don’t forget to put your battery pack in a water-type battery bag. You can roll it inside the Kayak so that when water comes in, they won’t ruin the connection of your battery. There you have it. We hope you find this installation guide pretty useful. Don’t forget to drop your comments down below in case you have any question. We will be right in time to answer them.